Tickle My Senses: 4th Blog Anniversary, a Big Thankyou & A COOK BOOK GIVEAWAY!! 4th Blog Anniversary, a Big Thankyou & A COOK BOOK GIVEAWAY!! My blog has completed 4 years !! Yipee! It's been lovely journey. I am truly happy and blessed to see my blog grow in recipes and readers over the years. Though there is still a long way to go, I am positive and pray that one day many more food lovers will reach out to and enjoy the recipes at 'Tickle My Senses'. In these four years I have learnt so much about cooking, food photography and made some wonderful friends, a truly enriching journey! I wish to thank you readers for your continued support & appreciation. Special thanks to hubby who inspired me into starting this blog and my parents and friends for the continuous support & encouragement. All your feedback and comments mean the whole world to me :) I hope you will continue to spread the love, share this blog with your friends and take pleasure in cooking and sharing these recipes with your loved ones. To celebrate my 4th Blog Anniversary I am having a wonderful Giveaway. I have had many requests in the past to publish my own cookbook, I am humbled by your requests and have given it some thought. 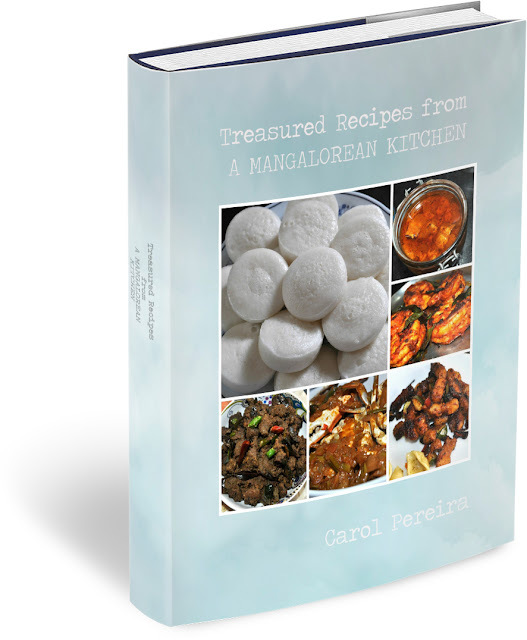 I have decided to give away this Christmas 5 digital copies of my very own Cook Book titled "Treasured Recipes from a Mangalorean Kitchen". An eBook that you could have sitting on your computer to browse any time of the day or one which could be printed out, to join the rest of your cook books on your shelves.. These ' Family recipes' will not be published on my blog in the future, but could be yours through this Giveaway. 1. This contest is open to all. 2. Simply make a dish from ticklemysenses.com and take a picture of the dish you make. The photo should be your own, on a clean background, with good lighting. 3. Send this picture to me via the Message tab on my Facebook Page or via email at carol@ticklemysenses.com, with the name of the recipe and a comment on what you liked most about the dish. 4. Once your picture is approved it will be put up on the Giveaway page on Facebook. 5. Next ask your family and friends to spread the love, get them to like and share your picture on Facebook. 6. There is no judging panel, the winners will be decided on the basis of the number of shares and likes of his/her photo. Hence the more shares and likes… the better your chance of winning! Have fun friends and all the best.